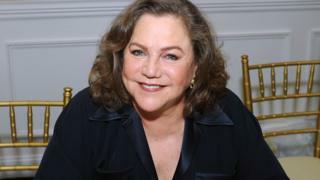 Hollywood actress Kathleen Turner, who found fame in 1980s films like Body Heat and Romancing the Stone, is being lauded online for giving an open and frank interview to New York Magazine's Vulture about the industry and her career. Turner, known best for her iconic smoky voice, dished Hollywood dirt on everything from the cast of Friends, to Elizabeth Taylor's voice and Donald Trump's handshake in the wide-ranging interview. Here are six of the biggest talking points from the piece. Asked by journalist David Marchese what had driven her career aside from luck, Turner responded simply with "rage". Pushed further, the actress replied: "I'm [expletive] angry, man" about "everything" and "injustice in the world". The interviewer then presses her on whether this stems from her career being derailed by illness. "I suppose there was a feeling of loss. Rheumatoid arthritis hit in my late 30s - the last of my years in which Hollywood would consider me a sexually appealing leading lady," she told the magazine. "The hardest part was that so much of my confidence was based on my physicality. If I didn't have that, who was I?" She later takes aim at accusations she was "difficult" to work with on set. "If a man comes on set and says, 'Here's how I see this being done,' people go 'He's decisive'. If a woman does it, they say, 'Oh [expletive], there she goes'." She discusses resisting playing one type of role, saying actors have a choice between wanting audiences to like them and becoming skilled. Turner takes aim at one unnamed actress for playing the same role for 20 years. "She even looks pretty much the same. She's probably one of the richest women out there, but I would shoot myself if I were like that, only giving people what they expect." The internet has been trying to guess who she is talking about since the article was published. Which actress was Kathleen Turner dissing? In the interview she speaks angrily about feeling like a "sexual target" and a "trophy" after her early breakthrough roles. She says that she always felt insecure in Los Angeles, because of an "unspoken assumption" in Hollywood "that women were property to be claimed". Turner says she learned that there had been a competition between actors Michael Douglas, Jack Nicholson and Warren Beatty about "who would get [her] first". "None of them did, by the by," she told Vulture. Hollywood star Elizabeth Taylor is one of several big names who come under fire from Turner in the interview. She criticises Taylor's performance in Who's Afraid of Virginia Woolf? saying: "I don't think she was very skilled." Turner describes the actress' voice as "awful" and "badly used". She also takes aim at Nicolas Cage for his work alongside her on the set of Peggy Sue Got Married, released in 1986. "He was very difficult on set. But the director allowed what Nicolas wanted to do with his role, so I wasn't in a position to do much except play with what I'd been given," she said. "If anything, it [Cage's portrayal] only further illustrated my character's disillusionment with the past. The way I saw it was, yeah, he was that [expletive]." Asked to elaborate on whether she meant the comment toward Cage or his character, she responded: "Listen, I made it work, honey." She also said that working with Burt Reynolds in 1988 was "terrible" and his actions on set made her cry. "His behaviour was shocking. It never occurred to me that I wasn't someone's equal. I left the room sobbing," she said. Turner also says she once slapped a male co-star in a theatre production who had bitten her, but doesn't reveal who. Turner, who guest starred as Chandler's father in hit US sitcom Friends, said she "didn't feel very welcomed by the cast" on set. "The Friends actors were such a clique - but I don't think my experience with them was unique," she said. "I think it was simply that they were such a tight little group that nobody from the outside mattered." Asked whether she ever bumped into Mr Trump in the 1980s, Turner responded: "Yes. Yuck. He has this gross handshake." She elaborated: "He goes to shake your hand and with his index finger kind of rubs the inside of your wrist. He's trying to do some kind of seductive intimacy move. You pull your hand away and go yuck."